I find increasingly that my clients are requesting a garden ( or a space within the garden) to relax….de-stress…or even meditate. Q : So…how best can we use and indeed interpret some of these ideas in our own gardens ? 1 A simple interpretation of the space: this means, basically, few elements to the garden and used in a non ‘busy’ or over fussy way. For example, planting can be limited to a few species to create a calming effect. 2 Simple, clean lines: ……spaces divided up with good,strong geometry. In the example to the right, we used a simple sleeper walkway meandering through a garden space. The walkway forms a perfect ‘S’ shape when viewed from above, but links the house, garden and summerhouse. 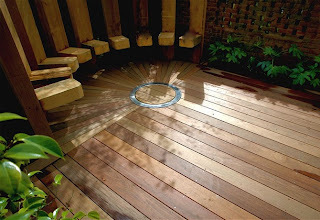 3 Use natural materials where necessary: This same garden was constructed with hardly any concrete or other unnatural materials. 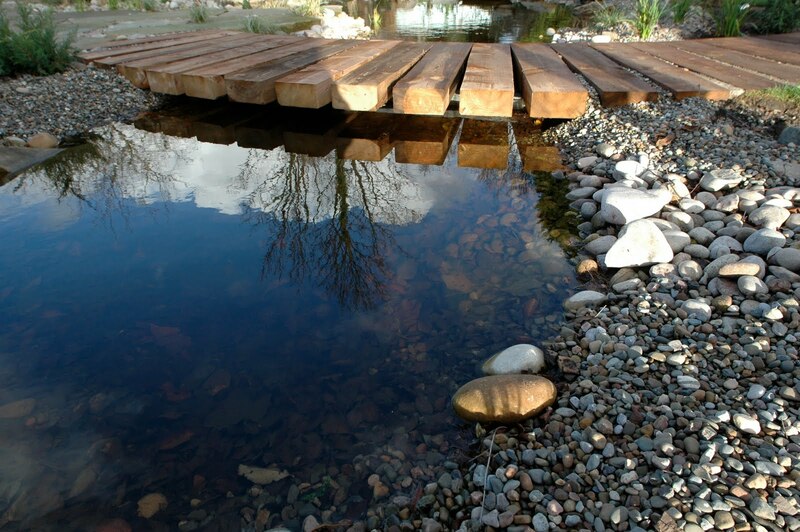 We used the simple elements of: timber, water and stone and chose plants carefully to help create a sense of harmony. 4 Use water: The use of water, whether still or moving, can have a very calming and therapeutic effect on the garden user. Both the sound of running water and the play of light on the reflective surface of a still pool can be calming. 5 Use of plants : using plants which are fragrant (some herbs and flowers have a soothing type of fragrance, for example lemon, lavender and mango - as illustrated by the widespread use of aromatherapy) Some plants are soothing because they move in the breeze (e.g. ornamental grasses such as miscanthus, bamboo etc) Some plants, of course, are reflective just because they look so awesome ! 6 Sustainability: The very essence of sustainable gardening has of course been around since creation began (living in tune with our natural environment). The delights of birdsong or the mere presence of other living creatures can have an instant therapeutic effect. 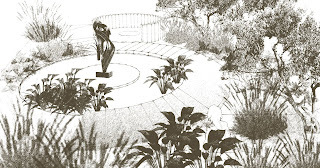 I remember a few years ago trying to finish a garden off to a deadline, as the client’s were due back from holiday. The garden was in a rural setting and featured a new, large wildlife-type pond, I was finishing off the last of the planting down by the water’s edge and feeling (bizzarely) somewhat stressed! Suddenly, a stunning damselfly fluttered by and settled on the surface of the water. All at once I felt a sudden inner calm...as if nothing in the world mattered and that everything in the newly created scheme had been worthwhile! I felt instantly connected to everything that really was really important in the universe…something that is so easy to forget in the hurly-burly of everyday life. 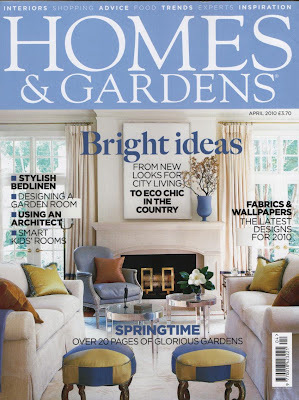 We have just been featured in this months (April 2010) edition of Homes and Gardens magazine. 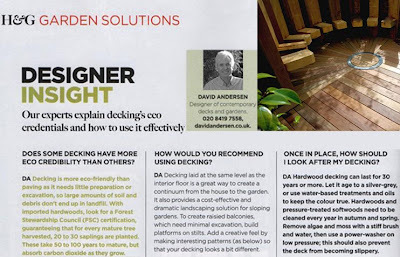 The article gave expert advice on the usage of garden decking and its 'eco credentials'. They also printed a photograph of one of our designs (hardwood deck with seating and circular fire pit). Great to see it in print!